This year’s Super Bowl was steeped in politics long before the game started, with controversies erupting over everything from President Trump’s close relationship with the Patriots to pro-immigrant commercials. But apparently it wasn’t enough to have the specter of the 2016 election hanging over the game; America had to watch the Patriots and the Falcons do a live reenactment of Election Night. The first half of the game looked like a blowout for the Falcons, with Atlanta racking up a 21-3 lead before Lady Gaga’s subtly subversive halftime show. In the third quarter, Falcons quarterback Matt Ryan threw a second touchdown pass to Tevin Coleman. Along with the extra point, that touchdown brought the score to 28-3. No team has ever trailed by more than ten points and come back to win the Super Bowl. Nate Cohn of the New York Times’ Upshot noted that New England’s chances of winning were even worse than Donald Trump’s. New England's odds heading into the Ryan fumble: 249:1, per ESPN. Trump's odds were 40x better heading into Election Night. Then New England, and the nation’s PTSD, came roaring back. In the third quarter, Patriots running back James White scored the team’s first touchdown of the game, bringing the score to 28-9. Then, in the fourth quarter, the Patriots racked up 19 points, including two two-point conversions. Suddenly everyone on Twitter started flashing back to the night of November 8. Wow. Just like the November election. Complete with Falcon fans celebrating their Super Bowl victory 30 min early. Julian Edelman set up the touchdown that would tie the game with one of the greatest catches in Super Bowl history. Falcons cornerback Robert Alford deflected a pass meant for Edelman, but he caught it just inches above the ground. 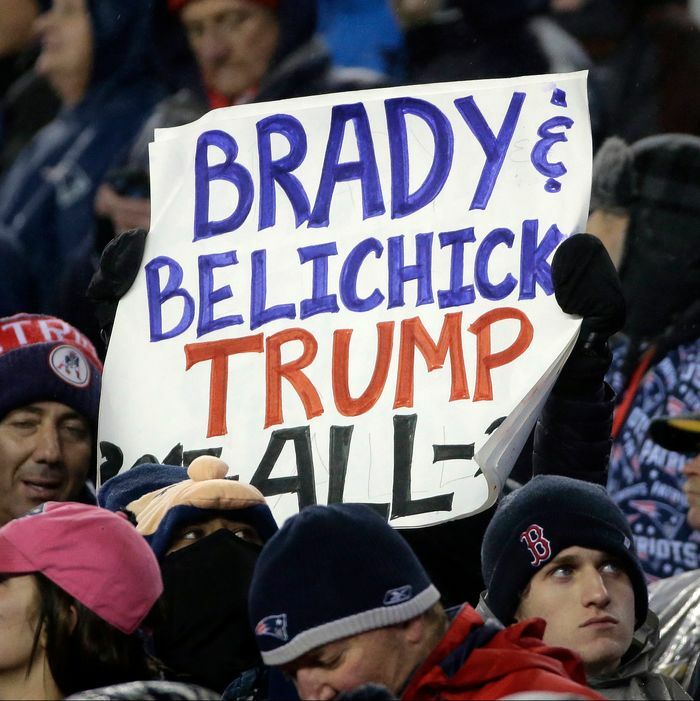 One possible explanation: Trump didn’t actually watch the Patriots’ historic comeback. WCVB reports that he left the Mar-a-Lago Super Bowl party around 9 p.m., when the Patriots were still losing.